Dental Implants Cost - UK | What should be my budget? Whether we consider our relationships, our self-confidence or our professional career, we all love to show off a great smile. You’re most likely visiting this website because you’d like to treat yourself to that perfect smile. However, before you decide on any treatment, it’s worth considering several factors. Dental treatment can sometimes be expensive, so it’s worth deciding whether you’re more suited to dentures or implants, to avoid any unnecessary costs. Even if you’re unsure, you can complete extensive online research, starting with this article that will explain all there is to know about dental implants. Dental implants are a durable option for those who wish to improve their smile, and despite the initial investment they can prove to be cost-effective over time, with reduced dental treatment costs. They’re formed from impressions of your existing teeth, so they’ll not only look natural, they’ll also fit perfectly amongst your other teeth. However, before you make your decision, it’s worth considering exactly what the dental implants process entails. After only a few hours of contacting surgeries and researching online, you may have been bombarded with a variety of different prices. Some will be more than others, so how do you find the balance between high quality and affordability? There is no right answer, but it is always worth treating extremely low prices with caution as there may be some hidden additional costs. However it is always wise to contact any potential dental surgeries for further information. Ensure that they will be completing the entire procedure, and that there are no hidden costs for materials or surgery preparation. Pre-surgery scans will cost money, especially if the clinic uses panoramic X-ray or 3D CT scans. These highly advanced scans will help to further reduce the already slim chance of complications developing, but due to their complexity they can be costly. If the scans reveal that your oral health isn’t satisfactory, then you may have to pay out for further treatment before the implant can be inserted. Scans will check for decay and disease, and any affected tissues may have to be removed to guarantee a long-lasting implant. If you need a bone graft then you should expect significant extra costs, as bone will be taken from elsewhere in your body and inserted into the jaw bone for drilling. How Much Do Dental Implants Cost In The UK? By having your treatment completed here in the United Kingdom, where both treatment and materials are more expensive than further afield, then you can expect to pay anywhere from £1,500 to £4,000 for your implant, abutment and crown. This has led many to consider treatment abroad, with significantly lower prices available in the likes of India and East Asia. So the total cost can be in between £1800 – £3100 for parts only, but it really depends on each and every individual’s requirements which can be confirmed after an initial test by a surgeon you can call on the above number to discuss with an dental implant advisor. When you are reviewing dental implant costs you should also ask if a guarantee for your implant is included (what is their guarantee & what does it cover & for what period). Since the high cost of laboratory, material and expertise in UK. 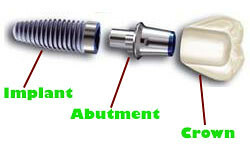 check how you should take care of your dental implant after the surgery and insurance options. Check this article on what you should consider before looking for dental implants in abroad. If you want to speak to a dental implants specialist to clarify please call on 020-33226656. Immediately after your surgery, your dentist will usually provide you with any required painkillers or anti-inflammatory tablets, and a mouthwash. The mouthwash will be used to keep your mouth clean, and prevent any contamination at the new implant. Your dentist will then advise you on how to best keep your mouth as clean as possible for the next week or two. You may be asked to refrain from smoking, and to wash out your mouth after eating food. This will help to prevent any food becoming lodged around the implant, leading to decay or eventually gum disease. These preventative measures allow the wound to heal properly, leading to a durable and comfortable implant. Dental implants are not normally covered by regular insurance, so it is best to consult professionals beforehand. You may not be covered, as many insurance companies consider dental implants as a cosmetic procedure – even if you’ve suffered irreparable or painful damage. Often, dentures will be covered due to their lower price. If your insurers will not cover your dental implant, then you may wish to speak to the clinic that will be performing your procedure. If they do not offer their own insurance services, they will happily recommend insurers who will offer you comprehensive cover. You can then be safe in the knowledge that your new smile will be permanent – even in the rare case that something does go wrong.